Inner Beauty is a sheer milky pink. The picture is two coats and as you can see it's a bit streaky. I don't normally wear colors like this. A ridge filling base coat would make this polish look a million times better. This is a great color for a french manicure or if you are going for that clean look. Blushing is another sheer color, this is more beige than pink. Again a ridge filling base coat is needed for these types of colors. This polish was sent to me unlabeled. I've gotten a few suggestions of it possibly being Summer Rain or Rio but I'm not 100%. It's a bit brighter in real life. This picture is two coats and I have a visible polish line, so another coat would probably fix that. For Audrey is pretty much a dead on dupe for Tiffany's blue boxes. I love this color but only wear it on my toes. Swatching it was the first time I had ever put it on my finger nails. I'm not sure if I would ever do it again. It applies nicely and is opaque in two coats. 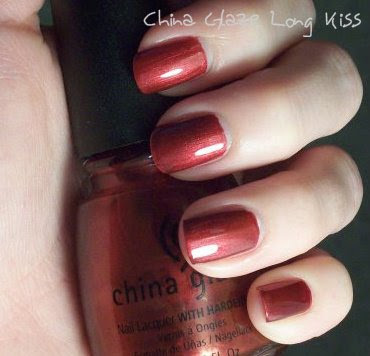 Long kiss is a deep red with very subtle gold shimmer. It's an awesome holiday color. 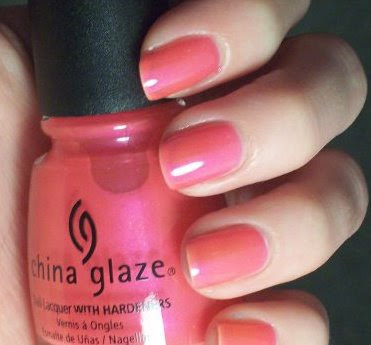 As far as I know all of these colors are current and can be purchased where ever China Glaze is found. Is For Audrey still sold in stores? Where can I buy that color. It looks so fabulous! I checked Ulta, but they don't have that color. would be very easy for you, such that you can do it once in a week with out any difficulty.Mini Manicure is a quick file. In mini manicure they do shape & polish and a deeply relaxing hand massage. itzzzkimmm- sorry for the delay in getting back to you! I saw For Audrey at Sally Beauty very recently. If you can't find it drop me an email.